Up and Down brown water bunker pricing is giving small-to-medium sized operators heartburn. It doesn’t have to be that way. By Richard M. Larkin, President of Hedge Solutions, Inc.
he recent free fall in oil prices is grabbing the atten- up fuel ef? ciency have certainly helped, but do not offer tion of many in the commercial marine business. protection against price spikes. What’s a Mother to do? TFerry services, cruise lines, tour boat operators, Hedging, a term de? ning the method of offsetting the tugs, etc. all consume signi? cant quantities of fuel to run risk of adverse price movements is a practice that dates their vessels. Customarily, the fuel cost is one of the larger back to the early 1600’s when Dutch speculators created slices of pie on the budget chart. Diesel fuel, or “bunkers” an exchange to trade Tulips, of all things. Later, farmers as they are often called, is a commodity; a synonymous across the globe, including here in the U.S., adopted this product traded openly around the world. This factor causes tactic to offset the risk of adverse price movements between signi? cant swings in the price over the course of time that planting and harvesting seasons. Today, hedging is a com- injects an enormous amount of uncertainty when attempt- mon practice for those who trade, buy or sell virtually ev- ing to predict where that cost is going to be throughout ery commodity known to man. Soft commodity industries the year. For many stakeholders, fuel represents up to 15% like coffee, sugar, and agriculture all participate in some of the total budget. 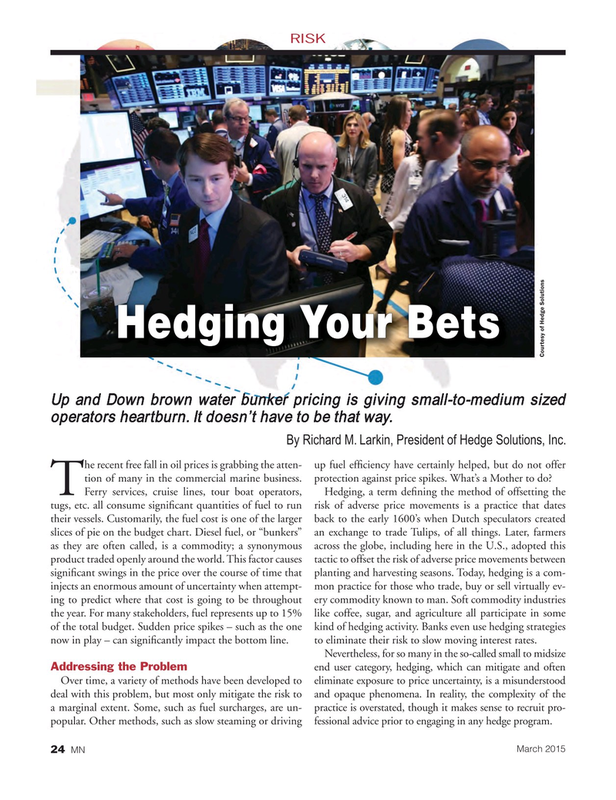 Sudden price spikes – such as the one kind of hedging activity. Banks even use hedging strategies now in play – can signi? cantly impact the bottom line. to eliminate their risk to slow moving interest rates. Over time, a variety of methods have been developed to eliminate exposure to price uncertainty, is a misunderstood deal with this problem, but most only mitigate the risk to and opaque phenomena. In reality, the complexity of the a marginal extent. Some, such as fuel surcharges, are un- practice is overstated, though it makes sense to recruit pro- popular. Other methods, such as slow steaming or driving fessional advice prior to engaging in any hedge program.